Prince George’s County, where I live, is one of the most affluent black counties in the country, and I see it every day: The black middle class has deep disdain for the poor. Here in Upper Marlboro, Maryland, people talk about residents of Seat Pleasant as though they lived in another world and were not 25 minutes away. Respectability politics are quickly absorbed by children. In high school, black students who were clearly struggling but giving their all were never valued by their peers and administrators as much as the black students with good grades who played sports. From the moment I stepped foot on my high-school campus, I could see that acclaim and recognition was allotted to a certain type of black student. If you didn’t fit the narrative, you wouldn’t be recognized for your efforts. You would not be supported through your journey. I’m in college now, and I don’t find that anything has changed. If anything, what I’ve realized is that playing by the rules is a guarantee of nothing. Richard Collins III went to college in Prince George’s County. He was one of the good students, the ones that teachers and administrators valued. He was set to graduate from Bowie State, already commissioned as a lieutenant in the US Army. The Root described him as “unstoppable.” And still, he was stabbed to death by a white supremacist in front of his friends. In this country’s romanticized fantasy of the “American dream,” Jordan Edwards—the 15-year-old high-school freshman shot in the head by police in Balch Springs, Texas—was recognized as a “good kid.” He was an honors student, played football, and was well-behaved. But did that cop care about what Edwards had achieved? In the wake of the shooting, comments flooded social media reminding people that “Jordan Edwards was an amazing boy who was unarmed and non-violent.” “He was a boy with a bright future ahead of him, taken abruptly by the police.” And while these notes may have been written with good intentions, they reveal an insidious assumption that serves to reinforce how remorseless institutionalized racism can be. Because what inevitably could not save Jordan Edwards is the same thing that I have been told would save me—or, as countless administrators have assured, “separate me from the bunch.” “Don’t sag your pants,” they’d say. “Speak proper; talking like that ain’t going to get you nowhere.” And most counterfactual: “You can get good grades and go to college, or you can chase that street life and end up in jail, or dead,” as though those are mutually exclusive; it certainly wasn’t for Edwards and Collins. 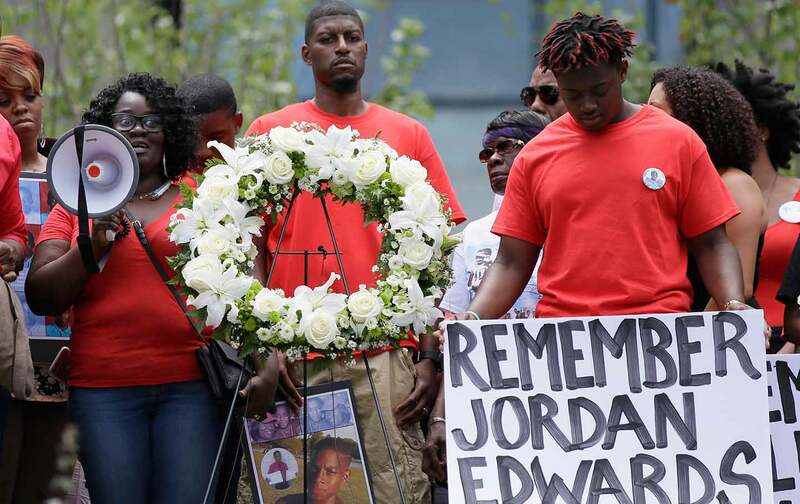 And while we mourn their deaths, we have to remember why we are mourning: Just like any other black life in America, neither Edwards nor Collins deserved to become another victim of America’s failed law enforcement. If we want to talk about black love and its revolutionary power, the range of our love must extend to those who don’t conform to respectability. Hashtags like #blackboyjoy and #blackgirlmagic strike me as revolutionary, one of many ripples in this wave of public black love. They’ve served as a repository for the voices of black men and women who refuse the stereotypes perpetuated by a white-supremacist society, and to express a sense of personal liberation and love—not only for one’s self but for our black brothers and sisters. But what happens when this love is conditional? What happens when this support is only allocated to a certain group of people? I’ve read articles proclaiming that black love is revolutionary, many from some of my favorite writers and activists whom I follow religiously on Twitter. I read these articles with high hopes, anxious to glean insight from people I see as revolutionary role models. But more often than not, I finish reading and step away disappointed. Not once do they mention the struggles of impoverished black people. Not once do they call to expand our range of love and empathy beyond the “success stories” and include those living in poverty. “I love Black people, I don’t care what they are doing, but when Black people are struggling, that’s when they are most beautiful to me,” wrote Assata Shakur. Her words inspire me. Black people survive in environments deliberately meant to destroy them—those who face that struggle are extraordinary, awe-inspiring. Revolutionary. Beautiful. We have created standards that have made our love and support exclusive, rather than inclusive. Take the Black Excellence movement, which can feel soaked in respectability politics. “Black excellence” is used to mark material and professional successes, but never the courage and determination it takes to stay strong through the struggles. Because as proud as I am of my black grads with bright futures, I am equally proud of the boy from Southeast DC who did not finish high school and works two fast-food jobs to make ends meet for himself and his family. I am proud of the young black man who at age 14 is graduating from Texas Christian University, but I am also proud of the 14-year-old young woman who barely made it past the ninth grade. We have to recognize that black excellence is not limited to people thriving in higher education, appearing on talk shows, or becoming multimillionaires. Black excellence comes in all forms. Being black and alive in a country that wants to see you fold at the hands of oppression is excellence. And it should get treated as such. For the black girls and boys who detest their blackness due to the internalized systematic oppression that has programmed you to hate yourself, you are loved. For the black girls and boys who have been brainwashed by the white-supremacist heteropatriarchal society that has conditioned you to become homophobic, you are loved. For my “welfare queens” and my “super-predators” who are viewed as good-for-nothing beggars and savage animals, you are loved. For my black women and men incarcerated, separated from their families, and deemed by the media—and even their own brothers and sisters—to be “criminals” who have “chosen this path,” you are absolutely loved. People use “revolutionary love” without really understanding what such a powerful phrase means. People talk about loving all black people, when really their love is exclusive to certain kinds of black people. Educated or uneducated, wealthy, or poor, “good kid,” or “street thug,” if you are black and living in America, your life is worthy, valuable, and constantly in danger. Systematic racism could care less about respectability politics. During the Jim Crow era, as Michelle Alexander wrote in The New Jim Crow: Mass Incarceration in the Age of Colorblindness, many African-Americans believed there was no other way to end bigotry than to act in a way that placated white people—respectable in a way that pleased white people, dignified in a way that reassured white people—all to show them that their racism had been misplaced; they had black people all wrong. For some, this strategy worked, particularly those with access to education and relative privilege. But those who didn’t and could not conform to the public behavior and economic activity expected by bourgeoisie America were viewed as “bad apples.” It’s a mentality that has caused a division between wealthy, middle-class black people and black people in poverty. Even worse, the former who disassociate themselves from the black urban poor continue to act, and are often expected to act, as representatives for the latter. This division diminishes, and often erases from public, the unity and solidarity that thrives among black people—a shame, considering how mesmerizing black love is. The compassion and care that we feel for one another, the displays of affection and humor and art we produce in honor of it, is breathtaking. If it is not in your life, or if you refuse to acknowledge it, I would have to say it is your tremendous loss. Shekinah MondouaShekinah Mondoua is a freshman at Montgomery College in Maryland.